UNION MILLS, IN. – Length, quickness, attacking the basket . . . all traits of the game that ultimately play a role in the outcome. 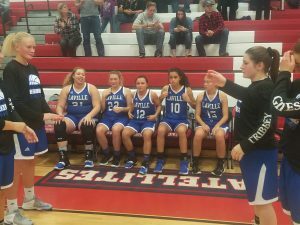 Saturday, the South Central girl’s basketball brought all three phases against the LaVille Lancers in a 66-25 decision. The Satellites forced eight first quarter turnovers and took a 20-0 lead before Elena Lindke found Trynitie Cox for the first Lancer score. After a 40-10 halftime deficit, the Lancers battled in the third quarter, as Trynitie Cox scored six of her career-high 16 points. Cox would finish with 16 points, 10 rebounds, two steals, two blocks and an assist. The Lancers managed to cut down on turnovers in the second half and battle for just a 26-15 margin. LaVille (1-1) will face Bremen in the home-opener Tuesday, November 6. The JV game tips at 6 p.m.
3-point field goals: LaVille 0, South Central 5 (Gale 2, Rudolph 2, Wolf 1). Totat fouls (fouled out): LaVille 15 (Dove), South Central 21 (none).